Hello everyone, this is a guide written exclusively here to inform you about familiars, starting from building management to which familiars are key fundamentals and which ones to prioritise depending on the type of player you are. 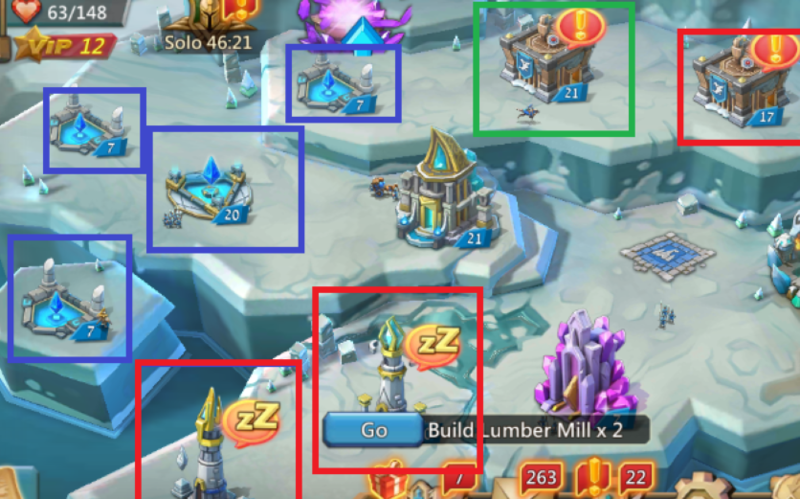 This guide's knowledge was analysed and discussed thoroughly by many members of the Lords Mobile Discord (https://discord.gg/ZxyuP6K) and special mention to Lebensohl of the Discord for providing the table provided in the guide. Let's begin with understanding what type of player you are before we can proceed with which familiar buildings you will build. Different players will have different goals due to their circumstances, resources and time available. Due to these different goals, different players will have different priorities. Two main categories that can be split at the beginning is simply, fighter or support type player. The fighter type player will aim for combat stats and any other benefits that aid their attacking/ defence/ survivability. The support player will aim for all the possible benefits that help support themselves and their comrades through resources or other benefits to aid their production of resources. Now let's dig deeper as to why this is important. As from the above table, forming your buildings around your goals is hugely important due to the enormous time investment necessary to train a Tier 3/4/5 Familiar to 60, which is when the bonuses arise most strongly. Combat stat familiars are found in the Pact 3/4's which contain Tier 3/4/5 monsters and as such combat focused players will be focusing on those Familiars. As where support type players may focus on familiars mentioned in the Hyper Guide (http://lordsmobile.forum.igg.com/topic?fcid=3&ctid=10237) which mainly belong in Pact 1/2/3. Let's now have a look at what buildings we have, what do they do and why are they crucial. Springs are the buildings in the blue squares, which provide all of these important attributes below. Gyms are the buildings in the green squares. They are fundamental to leveling your familiars and each gym allows an additional training slot for your familiar. Mystic Spires are the equivalent of barracks for familiars and they control how many pacts you can make at a time. The higher level the spire, the more pacts you can create at different level intervals. 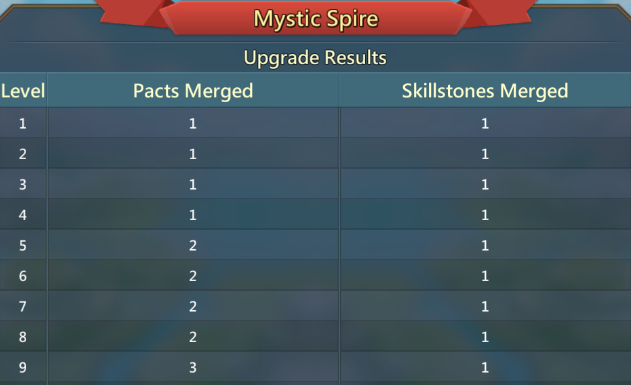 The springs determine how quickly you can merge pacts due to the pact merge speed increase (or addition of speed if you have gear). This is important for factoring overall merge speed below. The mystic spires determine how many pacts can be merged at time, hence determining your overall time of merging. This is important due to the different pact tiers and how long it takes for them to merge. The gyms determine how much maximum exp your familiars can get and how many familiars you can train at a time. This is the most important thing that players being introduced to familiars are facing, how does the gym and hero distribution work? 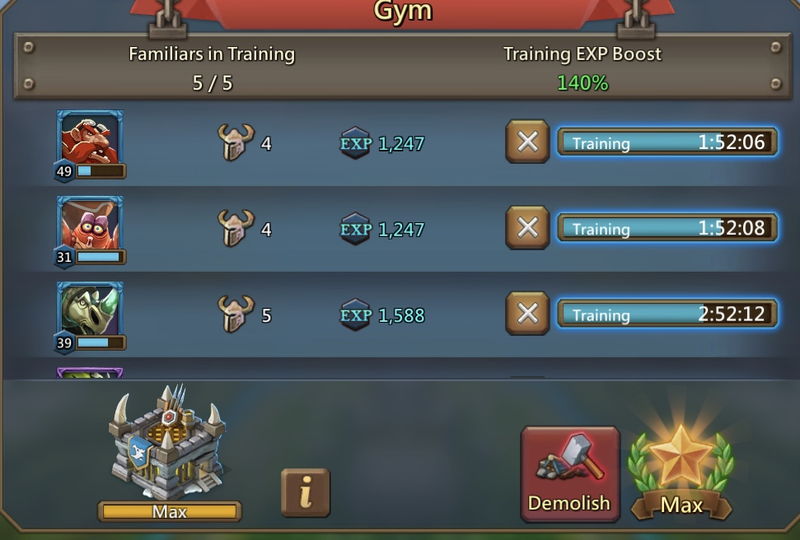 To train a familiar in the gym, you can assign it a hero or heroes for it to gain additional exp. The hero bonus exp starts from +10 down to +7 for the second, then +6, +5 twice, +4 three times and finally +3 bonus exp for each hero after. The above is an example of the setup I run for my familiars. The first 3 familiars are familiars I'm not focusing my EXP on, the 2 remainder are familiars are familiars I've decided to concentrate maximum EXP on. The EXP/ hour ratio will still be raised with more heroes on it as long as you complete the training to the minute despite not finishing the full duration. This setup is aimed to be more than 12+ hours to allow sleep & maximise EXP. Summarising everything together in this guide, all the buildings are important and knowing how much of each one you need is key to mastering familiars! First thing we'll discuss is the gyms. The gyms are dependant on your familiar progress and hero progress. The more familiars and higher level they are, the more gyms you will need. We'll be starting with 2 gyms when working on Pact 1, possibly Pact 2. Then moving up the gyms and decreasing the amount of other buildings as you work on higher Pacts. I recommend up to 6 gyms depending on how much anima you have in packs or whether you can buy packs with anima. This will leave you with 1 spring and 1 spire eventually. If you're concentrating on Pact 1's, what you may want is 1-3 spires depending on merge speed & how long you're inactive for. You will want more spires to accommodate the inactivity. Think of these as barracks and how much you want added or removed will ultimately depend on your game activity. The Springs will ultimately be your ultima hold and speed addition. If you're a F2P player or don't plan to spend money on anima, the amount of springs will determine how many pacts you can make per merge boost and how long it'll take overall. These are equivalent to manors and can be stripped down to accommodate the buildings above. The medals required for each grade have not been forgotten The medal requirement for each grade is far less than the EXP requirement for each familiar and in my opinion, will finish in time before 1 familiar hits 60 with the exception of Pact 1 Possibly. (from past experience of pact 1/2/3 completion). The main difference with Pact 1 is the medal rarity of the special monsters "Aquarius" and "Territe" which are easy to level but the medals are rarer than the others to receive. 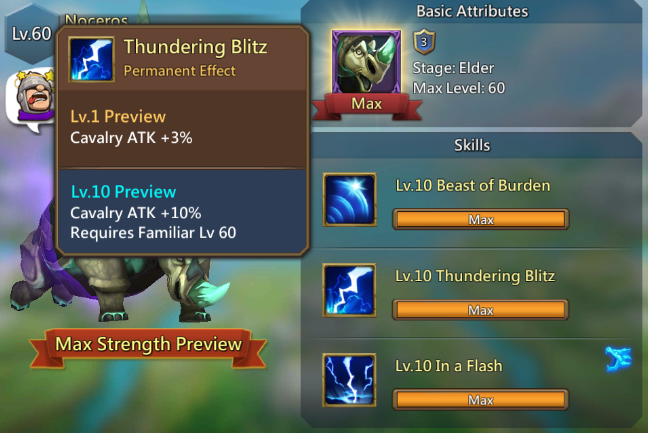 This may be discussed further in the future but as this guide is very long already, EXP will be the main attribute focused. Note these may not work for you so make sure you check your gear & research, then tune accordingly. Thanks again to the Lords Mobile discord members for providing discussions and analysis of different approaches to Familiars! R4 of [CaE]/ Cause and Effect. Solid guide. Wish I had this guide when I was first learning about the whole familiars thing! The tricky thing with familiars is finding the right balance between leveling up your familiars and acquiring the medals. 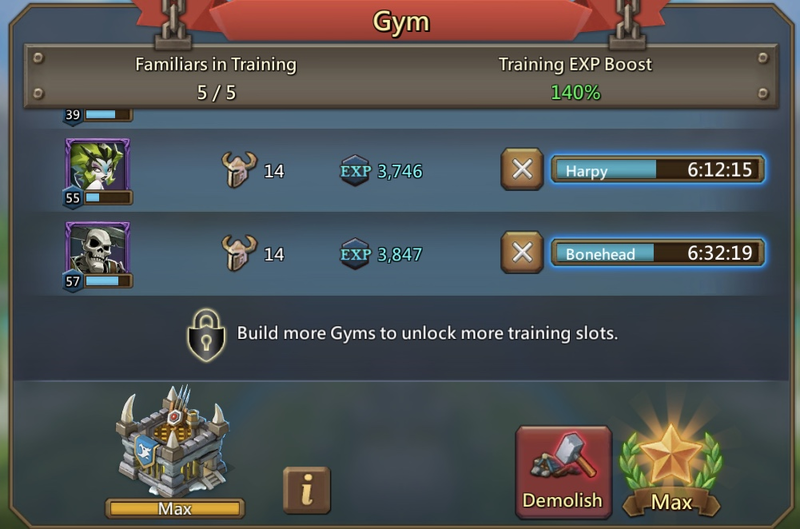 A question of the amount of gyms to have to train and springs to lower the time to produce pacts. Very nice guide. I always see people asking what's the right building composition for familiars and there's no one good answer, but I believe your summary of buildings seems perfectly logical. It's about finding balance with what you want to do with familiars.